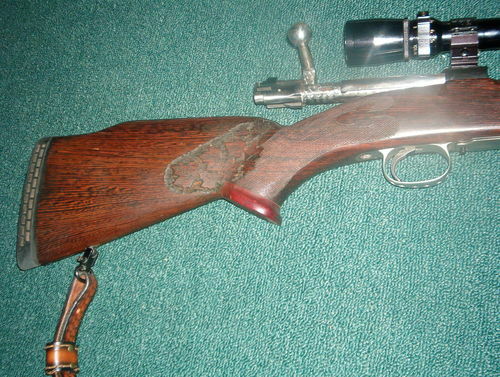 This varmint/benchrest stock is one of the very few solid, non laminated, stocks I’ve carved. It’s made from zebrawood and the marble texture of the wood is fantastic. Only one ugly problem… Zebrawood is brittle and you can see a lot of splinters in the last photo a closeup of the inlet area. I found out how brittle the wood is the first time I tried to carve a curved surface. Big chips flew all over the place. I had to climb cut the entire stock (I use a 2 1/4 hp router to carve my gunstocks). Climb cutting is going with the grain and is opposite to everything you hear about using a router. Only in my manual duplicator it’s safe and efficient to cut with the grain. I wasn’t able to find all the splinters and glue them back, so I had to slim down the curved forend so both sides would match. You can’t imagine trying to find a specific chip in a stack of wood chips from the last 3 stocks I’ve carved. A needle in a haystack would be easier to find. I hated giving up the search and slimming down the stock, but I suspect the splinter I was looking for got split into more than one piece as the router knocked it off the stock. The slab this stock is resting on is an elm slab that’s going to be part of a dining chair soon. I have 5 or 6 stocks to carve first, but as soon as I finish them, I’m starting on a live edge table and 6 chairs using an elm log I’ve saved for a special project. Now that’s one nice looking stock! As for the splinters, get in there with some 120 grit wrapped around a stick to clean that up in no time. Do you have the hardware for it yet? The splinters will sand out just fine, the problem is the splinters on the outside that I couldn’t find and glue back on. I had to sand the other side about 1/8” smaller to match. That makes the forend about 1/4” smaller overall. It’s still a bulky target/varmint stock and there’s plenty of wood for a walking hunt. Sad to say, it’s not my stock. I’ll be mailing it to Lexington, KY in a day or two with the other stock that I’m carving now. I’d be finished with both, but I wasted a 1/2 day searching for a chip is a big pile of chips! I hand cut a stock from wenge once. Its brittle and splintery like that too. I had to be careful to not split it out. Nice looking stock Hal. that’s another beautiful stock that we’ve come to expect from you. That zwood is no picnic to work with. I recently sanded some to 320, felt wonderful, applied 1 coat of shellac, and came back the next day and it felt like it had been sanded with 24 grit! WHOA !!!!! and thanks for the heads up on the Wenge. I’ve got a CHUNK of that I would like to send to HAl for another STOCK in the future. But , kind of planning on it being a laminated stock even thou it’s 8/4 thick. Looking at the one you posted , I think what I’m thinking will be really sharp and different and the MAN to complete that , HAL. Hal, I’ve saved a couple of the photos and sent email to some of my hunting/gun friends. Lot of praise for your work and several YOU LUCKY DOG …. Hal, Thats a beautiful stock you’ve created. That brittle wood must have given you fits. You clearly applied the Marine Corp protocol of “Adapt and Overcome” Very impressive work indeed. This looks better everytime I look at it.